Nihad Dedovic isn’t Zlatan Ibrahimovic, but people on the street think he is. Nihad Dedovic is a pretty decent basketball player, averaging 11.4 points per game in nine EuroLeague appearances for Bayern Munich this season. But when he walks the streets of major European cities, people swarm him asking for photos. That’s because he bears a frightening resemblance to Zlatan Ibrahimovic, one of the most famous soccer stars in the world and certainly the game’s biggest personality. Dedovic said he spent a few days in Paris this summer, where Zlatan had previously Paris-St. Germain to four Ligue 1 championships in four seasons, and was overwhelmed by the response from people who thought he was Ibra. It’s easy to understand why. Not only are their faces nearly identical, they now sport the same slicked back hair and identical facial hair. Plus, Zlatan is 6'5" and Dedovic 6'6", and both guys have the build of a professional athlete. 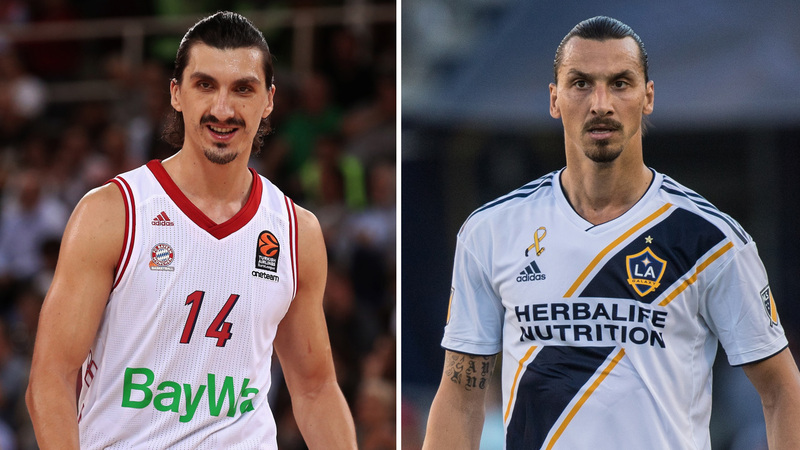 Both men trace their ancestry to the same part of the world—Dedovic is from Bosnia, while Ibrahimovic was born in Sweden to Bosnian and Croatian parents—which I guess might explain some of the resemblance. But Dedovic is certainly leaning into whatever natural similarities there are by growing the same hairstyle and goatee as his more famous doppelgänger. Can you blame him? I think we’d all like to try out being famous for a little bit. Mitch Marner tallied three assists in the Maple Leafs’ win over the Sharks last night, but trainer Bobby Hastings deserves partial credit for one of those. After Marner broke his stick, Hastings handed him a new one on the fly so he could join a 3-on-2 rush and set John Tavares up for a goal. Darren Rovell is officially leaving ESPN to join The Action Network, a startup that covers sports gambling. It sounds like the main reason he got hired is because he has built a large following on another company’s website. The occasion of Paul Johnson’s retirement is as good a time as any to revisit this in-depth look at the triple-option offense. ... These are the best 30 jerseys in NBA history, and we will not hear your arguments to the contrary. ... The Lakers have LeBron now but they haven’t hit their stride yet. The A’s have announced plans for a new waterfront ballpark in Oakland that looks really incredible. ... Rare footage of Lou Gehrig and Babe Ruth barnstorming in 1927 has surfaced. ... A man allegedly shot his son on Thanksgiving after an argument about NFL players kneeling. ... The Steelers are shockingly bad in games west of the Mississippi. A Texas ATM started spitting out $100 bills instead of $10 ones. ... You can buy an Amazon Alexa-enabled Big Mouth Bass. ... A woman in New York threatened a man with a stun gun after he allegedly spread his legs too far for her liking. ... Apparently people in China bet on fights between crickets.